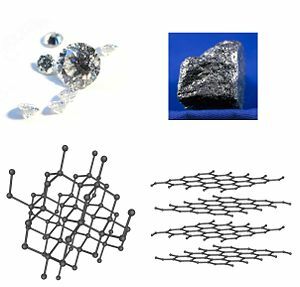 Diamond and graphite are two allotropes of carbon—that is, they are pure forms of the same element that differ in structure. If a chemical element can exist in two or more different forms, the forms are known as allotropes of the element, and this type of behavior is called allotropy. In each different allotrope, the element's atoms are bonded together in a different manner. For example, the element carbon has two common allotropes: Diamond, in which the carbon atoms are bonded together in a tetrahedral lattice arrangement, and graphite, in which the carbon atoms are bonded together in sheets of a hexagonal lattice. Note that allotropy refers only to different forms of an element within the same phase or state of matter (i.e. different solid, liquid, or gaseous forms). The changes of state between solid, liquid, and gas in themselves are not considered allotropy. For some elements, allotropes can persist in different phases—for example, the two allotropes of oxygen (dioxygen and ozone), can both exist in the solid, liquid and gaseous states. Conversely, some elements do not maintain distinct allotropes in different phases—for example phosphorus has numerous solid allotropes, which all revert to the same P4 form when melted to the liquid state. The concept of allotropy was originally devised by the Swedish scientist Baron Jons Jakob Berzelius (1779-1848). The term allotropy is derived from the Greek words allos, meaning "other," and tropos, meaning "manner." Allotropes of the same element can typically exhibit quite different physical properties and chemical behaviors, even though they contain nothing but atoms of that element. They may have different colors, odors, hardnesses, electrical and thermal conductivities, etc. The change between different allotropic forms of an element is often triggered by pressure and temperature, and many allotropes are only stable in the correct conditions. For instance, iron only changes from ferrite to austenite above 1,333°F (723°C), and tin undergoes a process known as tin pest at 56°F (13.2°C) and below. Typically, elements capable of variable coordination numbers and/or oxidation states tend to exhibit greater numbers of allotropic forms. Another contributing factor is the ability of an element to catenate. Allotropes are typically more noticeable in non-metals and metalloids. diamond—an extremely hard, transparent crystal with the carbon atoms arranged in a tetrahedral lattice. A poor conductor. graphite—a soft, black, flaky solid. A moderate electrical conductor. The C atoms are bonded in flat hexagonal lattices, which are then layered in sheets. Plutonium has six distinct solid allotropes under “normal” pressures. Their densities vary within a ratio of some 4:3, which vastly complicates all kinds of work with the metal (particularly casting, machining, and storage). A seventh plutonium allotrope exists at very high pressures, which adds further difficulties in exotic applications. Cotton, F. Albert, Geoffrey Wilkinson, Carlos A. Murillo, and Manfred Bochmann. 1999. Advanced Inorganic Chemistry. 6th ed. New York: Wiley. ISBN 0471199575.